This past Spring, one the Inland Northwest's most popular nightclub's, Big Al's Country Club of State Line,ID shut it's doors for the final time. We've never heard the official reasoning for the closure but have heard of both health issues and even that the business was losing money due to alcoholism from a owner of the business. But after a Summer season of the big red bar sitting empty it looks like there soon will be new life for the well positioned club. Signs are up now confirming that where Big Al's once was, will so be, Jeremy's Nashville North. Nashville North is a new country themed night club that should open sometime in October. The business has been purchased and will be operated by Country music recording artist Jeremy McComb . McComb , who's own country music career began in the State Line bar, plans to continue much of what Big Al's offered. The new bar also promises to bring performances from " top notch Nashville Talent " . The business will also be hiring an unspecified amount of new staff for a full experience. 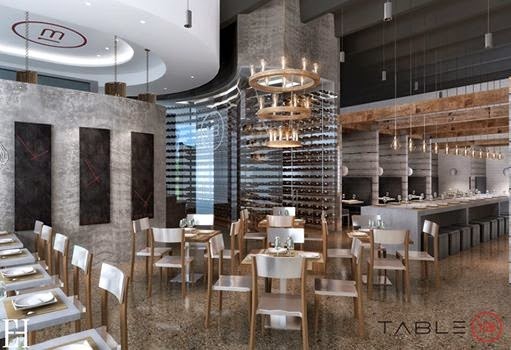 Nashville North will be more then just a bar, as the business is planning to also offer some food. The bar will partner with a Coeur d' Alene based BBQ business called Bohica Smoke to bring some food options in addition to the bar. Something's in store for the Hot Rod Cafe space?!? Looks like something is finally in store for the building that once housed the Hot Rod Café on Schneidmiller Ave. in Post Falls. 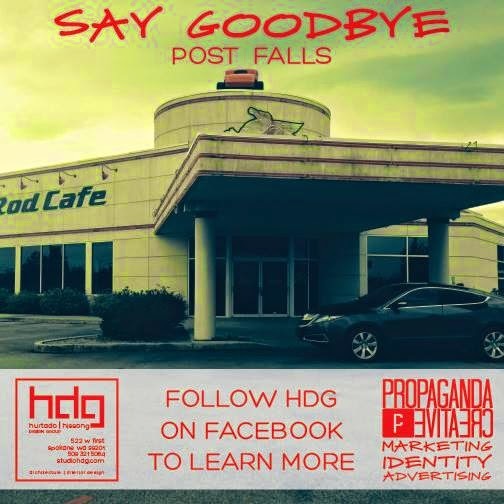 Spokane based design firm, HDG Hissong + Hurtado Design says they are planning a major renovation and a new business is coming to the space. But as of now their exact plans are very vague. All they do say is that the new space will be "badass" and " exactly what we have needed in this town for the last 20 years"
We will continue to watch for any news as this could be one of the biggest new business stories of the year. Terrain seeks permanent home, will launch "The Campaign for Terrain"
Terrain is Spokane's, and the entire Northwest's largest art exhibition. The event began only a few years ago and has now grown to attract thousands each time. The event allows guests to take in the hundreds of pieces of art in a interesting and historic vacant building. Terrain has in fact gotten big enough to spin off a sister event called Bazaar which is more of an arts marketplace. But the organizers behind Terrain are ready to take their passion for art to the next level. By giving Terrain a permanent home, still in Downtown Spokane. The plans call for a new non-profit art gallery and performing arts space that could be open, even on a daily basis. And just where will this new Terrain space be? Although I don't have confirmation a recent promo e-mail mentions that space where the Terrain 7 event will be, will also be their new home. The event, and apparently their future home will be at 304 W. Pacific Ave in a historic section of Downtown Spokane that's recently became home to several other creative businesses. The building was once the warehouse for a cracker company but has sat vacant in more recent history. I highly encourage everyone's support of the new drive by Terrain. Spokane's art community is a very passionate group who are growing. Such a local venue would be a huge asset to the community. Also, as mentioned before the next Terrain event is coming up soon. Terrain 7 will take place at 304 W. Pacific on Friday, October 3rd 2014 from 5pm till Midnight. The Terrain 7 event will feature 255 artworks from 142 artist and with the entertainment of live music from 10 bands. 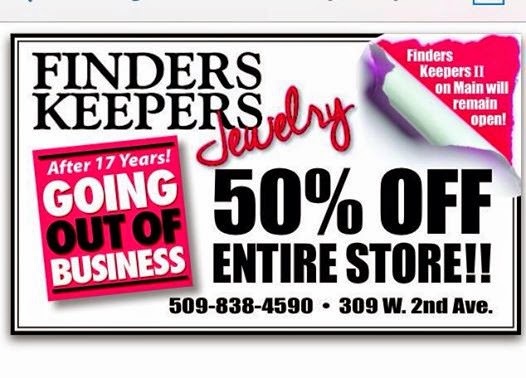 After 17 years in business, and earning a reputation as one of Spokane's most popular boutiques, Finders Keepers is closing. Finders Keepers operates both a jewelry boutique at 309 W. 2nd Ave and a women's clothing / dress boutique, called Finders Keepers II, located at 18 W Main Ave. The closure is for the jewelry store on 2nd only. The location on W. Main will remain open. The closure is due to slowing sales at this location. A going out of business liquidation sale is on now, merchandise in the store will be all be sold off at 50% off . In case you haven't heard, joining the newly opened Target store in the South Hill's Regal Plaza shopping center will be a new Petsmart big box pets store. Inland Northwest Business Watch first caught wind of this new store back Jan. and it's very exciting to finally be hearing mention of it's opening. The new South Hill / Regal Plaza store will host an official grand opening on Saturday October 18th with the store opening after a 9am ribbon cutting ceremony. We don't know if the store will do a soft opening before this date however, just that this will be the official grand opening. The new South Hill Petsmart is a full store just like the chain's other Spokane area stores. This new location will offer both grooming and training services in addition to it's retail operations. Spokane International Airport continues to outdo itself in terms of providing a excellent customer experience. The airport has already made it's wifi service and baggage cart service free, but is now constructing a full car wash for customers parking at Spokane International. 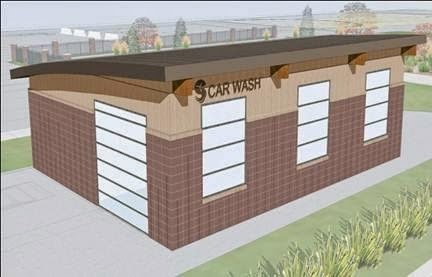 The new car wash will be a small building housing a touch less car wash and will be located near the main parking exit area. The car washing services will also be free to parking lot / garage customers. I think it's time to chock up one more success story for the brokers and agents of Kimele & Hagood Company as they've re-filled the empty storefronts of the Coeur d' Alene Resort Plaza Shops. The Coeur d' Alene Resort Plaza Shops is a small but well positioned enclosed shopping center in the heart of Downtown Coeur d' Alene. And it doesn't get much more "prime" in terms of prime real estate with the mall being attached by skywalk and sidewalk to the Coeur d' Alene Resort itself. So because of that it's seemed a bit odd seeing the mall sitting half empty for most of the summer tourist season. But all that is now almost over with one recent opening and three more businesses opening soon there. One Good Thread is retail store version of the onegoodthread.com web site. The web site is based in Downtown Spokane and was originally purposed for a location on Third Ave. in Spokane, where the companies offices and warehouse are also located. The One Good Thread retail store is located in the former paper and gift shop space near the Sherman Ave. entrance. The new store sells much of what can be found on the onegoodthread.com web site. Including mid to high end children's clothing with many brands that can be hard to find elsewhere. One Good Thread is now open. We don't have as much information on Chamira other then it will be a women's clothing boutique. The business will be further into the shopping center in the former Painted Pony space. Climb Works is not a new business but is new to Coeur d' Alene. Climb Works is small chain of zip line tour businesses with a store front to sell their zip line tours and some other merchandise. The exciting aspect of Climb Works is the new location will be their because the company is setting up a zip line route somewhere in the local area soon. We hope to get more on this. Climb Works will open their store towards the interior of the Coeur d' Alene Resort Plaza Shops taking the former Smitten clothing boutique space. Speaking of local business success stories, Memory Lane Gems, is a new second location of Memory Lane in Silver Lake Mall. The business was originally a part of Widgett's Antiques and formed into their own antique shop in the North Coeur d' Alene mall. Memory Lane Gems will be much like the Memory Lane Antiques store in the mall. Selling a bit of everything vintage. Memory Lane Gems will take over the former Gentlemen's Corner shop in the center block of the Coeur d' Alene Resort Plaza Shops. What is going on with Splash? Splash was bar / dance club that was owned by the Resort and located in the front section of the Resort Plaza Shops right along Sherman Ave. . However it closed a couple of months ago following issues with selling drinks to minors. Today that high profile space is believed to still be empty. 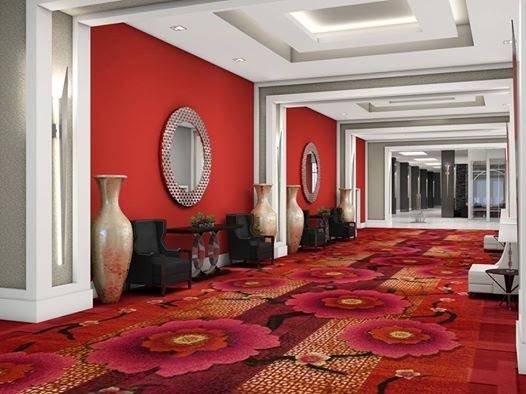 We have no confirmation but believe the Coeur d' Alene Resort is planning a new business in the space. It's that new business that is the question. I have heard of both a taphouse style bar and steakhouse planned for the site. We do think something is coming soon and will update everyone as soon as I know. 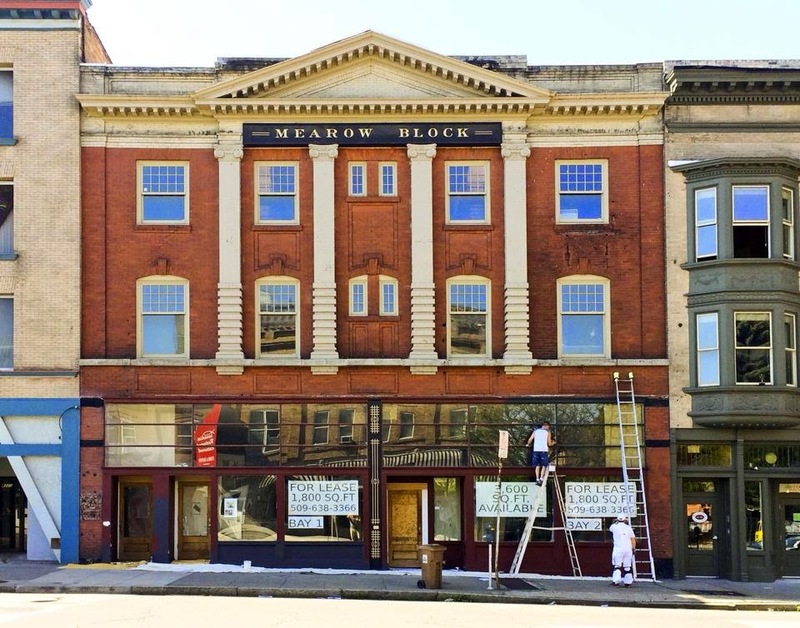 The Globe Building, historically home to the Globe Hotel, and more recently home to the Globe Bar & Grille has a new owner and like a lot of other Downtown buildings right now, a lot big things are coming soon. The Globe Hotel building is located on the eastern edge of Downtown Spokane at the corner of Main and N. Division ( 211 N. Division ). The building has sat empty since the former bar's closure in later 2012 but all of that will soon change. The building has been sold to local real estate investors,Kevin Edwards, Mark D’Agostino and John Pariseau operating as Globe Building Partners,LLC . The plans are currently a little vague but are still coming soon. The ground floor will remain for commercial uses and will defiantly contain some sort of bar as a liquor license application has already been filed. We have heard some of the space may become retail and have also heard that the neighboring Blind Buck bar may expand into some of the Globe's space. We are expecting to learn more on these plans very soon. The upper two floors of the Globe Building will also be completely renovated and re-opened. Those plans are also vague with those floors becoming either office space or new apartments. But no mention of how many apartments, offices or news on potential tenants. The upper floors of the Globe Building have been vacant for many years. Rarely do I get as excited about a new building or renovation project in Spokane as I am about The Bickett . But I admit I'm geeking out a bit about this revivement of piece of Spokane history. The Bickett is a historic former hotel building on the eastern edge of Downtown Spokane. The building's address is 225 W. Riverside and was built in the early 1900's. The building has been completely redone on all three floors. The ground floor which faces out onto Riverside has been renovated into new commercial storefront space, perfect for retail businesses. The space is being leased out as two bays, both with 1,800 square feet of space. Currently there are no new tenants moving into that space but expect the spaces to fill fast with the prime Downtown location. The upper two floors of The Bickett have been turned into loft style apartments. The upper floors hold eight apartments with varying sizes and rents. The apartments at The Bickett however have turned out to be a good asset, because as of last update the building has apparently already leased all but one of those lofts. Watch their Facebook page for more info, a link to that is at the bottom of this posting. 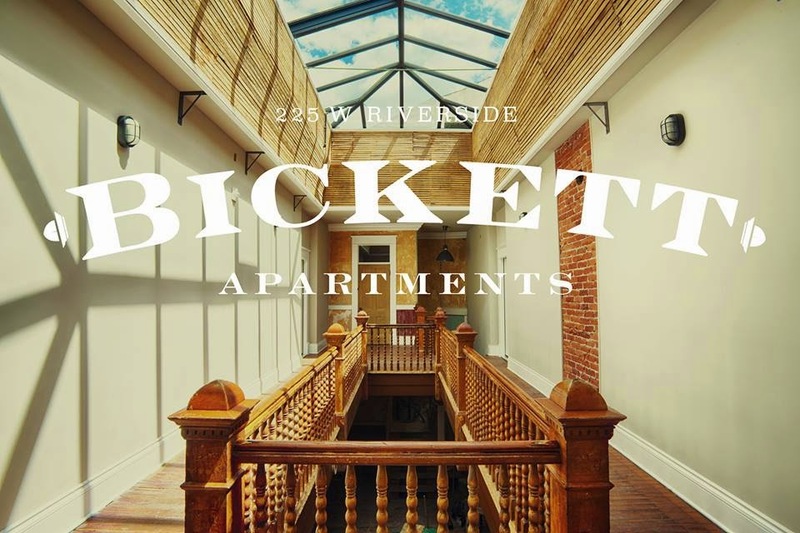 The Bickett project was done by locally based developer Jed Conklin and the building itself was formerly among the real estate holding of Developer Rob Brewster who defaulted on his many local properties a couple of years ago, most of those we're Downtown and many have also now been sold. From the "didn't see that one coming" department, Dawn of the Donut, a popular Zombie themed donut shop on Division St. in-between Downtown and the Northtown Mall (3402 N. Division ) announced they will go out of business permanently. The businesses last day of operation will be next week, Sept. 14th to be exact. The store is up for sale and may be able to be saved if a buyer comes forward. The closure is for both the store and the Dawn of the Donut food truck which has been around town for the last several months. It's also noteworthy that the business as a whole is actually still new, opening about this time of year, last year. The grand opening their was meet with long lines and many local media mentions. We have sad news Spokane. Dawn of the Donut is closing our doors on Sunday September 14. Please come in and get your favorite deluxe donuts while you can over the next week plus, before they are gone. Thank you to all our fans and loyal customers. IMPORTANT UPDATE: Only a couple of day's after the closure was announced the business was sold. It, in fact will not close. 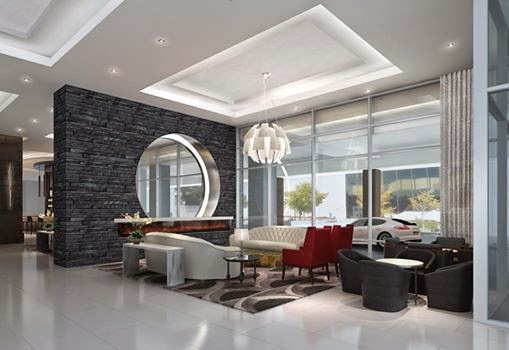 The new owners seem to have big plans, already selling some décor. Adding new hours and new donut variety's . We may have more on this soon, either way Dawn of the Donut, as of now is no longer closing. In addition to tracking new local businesses, another interest of mine is craft and local beers. So, I think it's great news that the first of what will soon be two Growler Guys locations in Spokane is now open. The first local location of The Growler Guys chain is the location in North Spokane. That location is in a Heritage Village Shopping Center close by The Y at 9329 N. Newport Hwy. The new store is creating an interesting corridor of beer with Total Wine & More and Pints Alehouse, both huge supporters of the Spokane beer scene within a mile of each other on the same arterial roadway. The North Spokane Growler Guys is in more then 1,500 square feet of space and sells and fills growlers of beer. In fact that's the main base behind the chain's stores. The chain is based in Oregon and is growing chain with nine locations around the Northwest and more coming soon. Growler Guys stores are also gaining a name for themselves by the amount of beer taps available. Growler Guys locations have around 50 beers on tap, including the new North Spokane location who's web site currently list 48 taps from the common to the more difficult to find beers. And, yes plenty of beers from Spokane based microbreweries. Also, shortly after the news came out that Growler Guys was coming to North Spokane, was a mention of another coming to the South Hill. That location was to be at 2933 E. 29th, but the liquor license there was fought by the nearby Southside Christian Center church. The chain backed out of that location due to the church's opinion . But now The Growler Guys has found a new location on the South Hill and WILL be opening soon. The new South Hill Growler Guys will be similar to the others and will be at 1314 S. Grand Ave. Suite 4. That's nearby the new South Hill AAA offices and a short trip down the hill from Manito Tap House. We don't have an opening date for the South Hill store yet but will be watching for it closely. This just in from the people operating the Spokane Business & Industrial Park in Spokane Valley. They have a couple of new tenants who've moved into space there creating more local jobs. Appliance Recycling Outlets, LLC has leased approximately 4,800 square feet of space in Building 2 in the Spokane Business & Industrial Park. Their primary business is warehousing of appliances. Mission Foods, in the tortilla and chip food distribution business, has leased approximately 12,600 square feet of space in Building 33 in the Spokane Business & Industrial Park. A local Spokane Washington family owned taco truck that strives to bring authentic Mexican food to our fellow people. Creating and serving delicious plates that will awaken your taste buds is our passion. Our sauces are hand crafted and specially paired to each dish. Come and satisfy your appetite for authentic Mexican street food. Story behind the food truck: Sean Campbell, working as a commercial diver and his fiancée Ana Silva, a barista, were living down in Louisiana when they made the decision to move back to their home town of Spokane and open a food truck. Ana’s father Juan, who has been in the restaurant business for over 30 years, trained the couple to cook. They serve king sized burritos on 14” tortillas, tacos, and quesadillas. Each item comes with the choice of either carne asada (beef), adobada (pork), or pollo (chicken) along with the usual toppings like pico de gallo, guacamole, rice and beans. They are at the Conoco station from 11am-7pm Monday-Saturday, and downtown around the bars on Friday and Saturday nights between 11pm-3am. Selling fresh gluten free foods, including pizza's , baked goods, crackers , granola, cheese balls and much much more is Cole's Fine Foods, a new business now open in North Spokane. Cole's Fine Foods even includes products made with Cougar Gold Chesses from Washington State University. The store is located at 521 E. Holland Suite 20. Noodle Express has, rather un expectantly, closed the doors to their Post Falls location. The location closed due to the chain losing it's lease and slow sales. The location had been in a strip mall at the corner of HWY 41 and Mullan Ave. The Post Falls Noodle Express is the only local location affected and another location is still open in Hayden in the Prairie Shopping Center at US 95 and Prairie Ave. Serving up delicious Mexican food, including huge burritos in a fast food type setting is Atilano's who plans to add a new location soon in North Spokane. Atilano's will take over a building that was last another Mexican restaurant at 802 W. Francis Ave.
Stir, a restaurant and martini bar in North Spokane at 7115 N. Division has gone out of business. Custom cakes are available , but is only one part of the business over at the new Lake's Cakes. Lake's Cakes is a full bakery / cake shop in the Logan neighborhood nearby Gonzaga University. The business also highlights their mason jar cakes, which are individual serving cakes served in none other then a mason jar. Lake's also sells some coffee drinks. The business can be found at 1718 N. Hamilton Ave.
We will have a lot more about them tomorrow as we will post a post directly about this new food truck. Once described as Spokane's Best Kept Secret, The Library Lounge, has closed it's doors for good. The bar had operated near Downtown in the Quality Inn Downtown ( 110 E. 4th Ave. ). No word what, if anything will replace the space within the highly visible Downtown hotel.